Silk tie dyed Easter eggs are so much fun to make and way less messy than buying a dying kit or using vinegar and food colouring! First you’ll need to start with 100% silk ties. Right now we’re on skiing vacation, so rather than rid Mr. MK of a few duds laying around in his closet, I picked up a few from a thrift shop in Banff. It’s a good thing we were buying them to destroy, because the pickin’s were slim and ugly (unlike me … ahahaha). 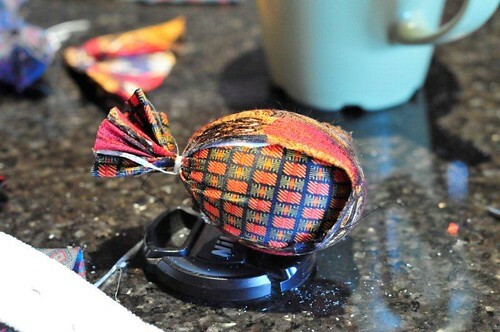 A good looking tie doesn’t necessarily mean a good looking Easter egg, so go ahead and use whatever you can find. Generally, I’ve found brighter colours turn out the best, but the results are always a bit of a surprise and what make this so much fun. Go ahead and open up the ties by removing the stitching up the middle. Most likely you’ll find that there is a white liner inside the tie. Set this aside to use later on. 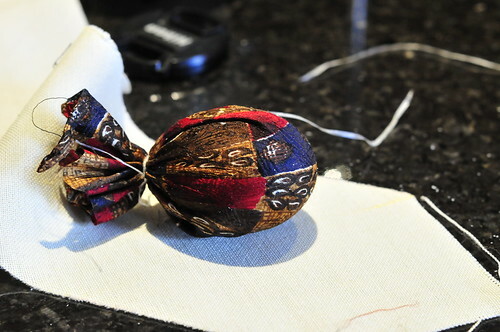 Wrap your egg in the silk fabric and tie it up at one end. We used dental floss, mostly because we are on holiday and I didn’t bring any sort of string. Just call me McGuyver … or not! This is where you can get creative. You can use one large piece of fabric or several small strips. 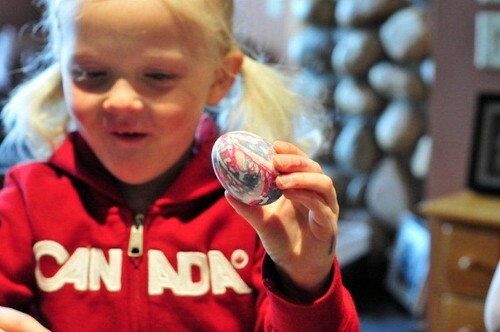 We found it was easier for small hands, if the fabric was wet when it was wrapped around the egg. In addition, through trial and error we discovered that you don’t get large white spaces on your finished Easter eggs if you wrap the egg many times over with the string. 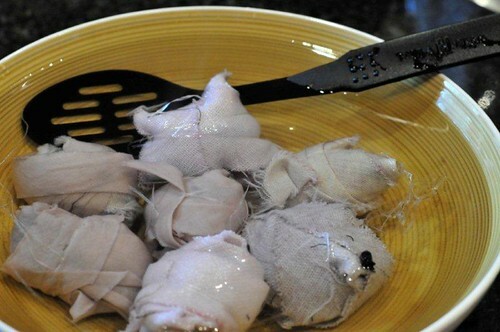 After you’ve wrapped the egg in silk you’ll need to wrap it in a clean white cotton. Normally, I’d cut up an old pillowcase, but our holiday accommodation doesn’t come with old pillow cases, so we used the white liner that was removed from the tie earlier. Boil the eggs for 20 minutes in water and a 1/4 cup of white vinegar. My kids are impatient, so I have a bowl of cold water waiting for the cooked eggs. 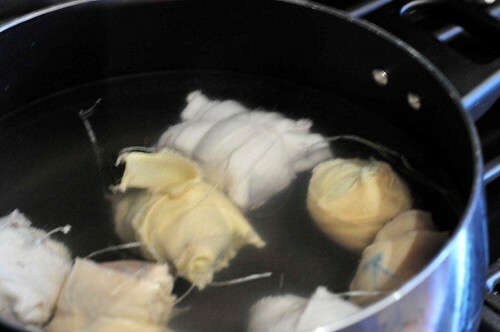 I remove them from boiling water and let them sit in the cold water for 10 minutes. The kids love unwrapping them! Every one is different. If you’ve enjoyed this post, please subscribe to my feed. Beautiful! I so need to get around to trying this some day. .-= Madeline´s last blog ..Well, You Know How Bunnies Are… =-. .-= jafer´s last blog ..And so this is Easter =-. .-= Angella´s last blog ..What You Donâ€™t Know Wonâ€™t Hurt You =-. Gorgeous eggs, I am going to the Thrift store right now to look for ugly ties. A great craft to do with the grandkids tomorrow while waiting for the turkey to cook. Thanks. E-mazing! Seeing ad I already boiled my eggs & bought the paas set, too late for this year but hoping I remember it for next year! .-= Jenn B´s last blog ..Ryanâ€™s Tweets for 2010-04-03 =-. Thanks you for your article. .-= Trouitre´s last blog ..Paris sportifs gagnants : La rÃ©fÃ©rence des stratÃ©gies de paris sportifs =-. Love this idea! Since we are moving we didn’t do up any eggs this year, but I’m going to have to remember this for next year. I need to try this sometime. I love the pebble placemat/runner. That is so stinkin’ cool. I think I’m going to give this a try. I can’t wait to show the kids. I love how intricate it looks. Just wondering how the design got transferred to the eggs? .-= Rory´s last blog ..New Zealand Via Road & Rail â€“ A Journey Through Natural Splendour =-. Are you stinkin kidding me? Those are GORGEOUS. I will definitely try that next year. .-= Jenny, Crash Test MommyÂ´s last blog ..I am titling this one â€œSPRING! IS! HERE!â€ which has nothing to do with the post, but deserves to be screamed from the rooftops because Spring? IS. HERE. =-. Beautiful but is that safe to eat especially for children? Oh…how…COOL…is…that!?!? We stay over my mom’s house every year and color eggs on Good Friday. I am so going to try this, next year. It looks easy enough, maybe even I could do it…juuuuuuust maybe ;) Thanks for sharing! 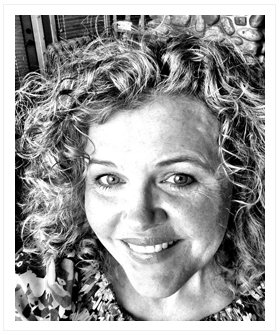 .-= Liz@thisfullhouseÂ´s last blog ..NWF Be Out There Challenge: Reflections, Senior Living and Shuffleboard =-. They’re just beautiful! How/where did you learn to do this?? .-= PaulineÂ´s last blog ..Honest to goodness, would you just look at this! =-. How fun! Yours turned out beautiful, I wish I had of found this before Easter! .-= TaraÂ´s last blog ..Do you need to give your children vitamins? =-. These are gorgeous! I saw this in a magazine once and have always wanted to do this but never knew where to find cheap silk ties – not sure why the thrift store never crossed my mind. Thanks for the tutorial – you’ve inspired me to give it a try this year! Those are so cool! I can’t wait to try this with my kids. By the way, I am a tad bit envious that you are in beautiful Banff. These are sooooo beautiful & creative! Will this work with egg shells that have the egg already blown out of them?? but not if it won’t work or the boiling will cause the shells to crack. or will the boiling cause them to break? I’d prefer to blow the egg out so we can keep our beautiful creations. @Anna Dueck, I’m not sure Anna! We really tied the ties on tightly and there was a lot of pushing, pulling and squeezing. I can’t imagine the blown eggs making it though that! Let me know if you try it and how it works out. I’d prefer to blow the egg out so I can keep our creations longer. I’ve seen these done before, but never as beautiful as yours. They are gorgeous. this is brilliant! i LOVE it!! wow!! That is a GREAT idea!!!!!!! I just might have to try this! Anyone want to bring ties to my house? I’ll provide the eggs and boiling water. Im going to try this! That is so cool!!!! I want to try it too!!! This is probably a dumb question but, are the eggs edible? Am I understanding correctly that you do this to raw eggs and then boil them in this process? These are beautiful! What a unique way to color eggs! Um…so does anyone know if the eggs are still edible after doing this? I’d love to do with this my kids, but they also love to eat the eggs after…. 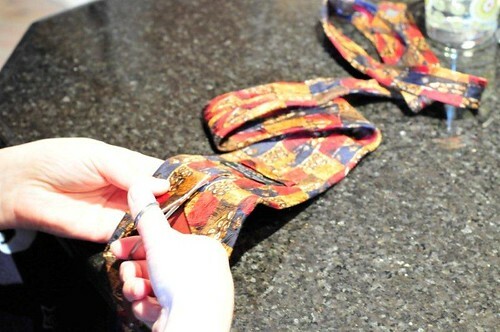 I went to the thrift store this week and bought 10 ties so I can try this this weekend! It looks so cool. I tried it. They turned out soo cool! this is pretty darn awsome!!!! I did my project today, and the blown out eggs worked equally as well as the hard boiled ones, although we did have 1 casualty. After I blew the eggs out, I baked the shells in the oven for 10 minutes at 350 to strengthen them a little. Wow how simple and easy! Love it! 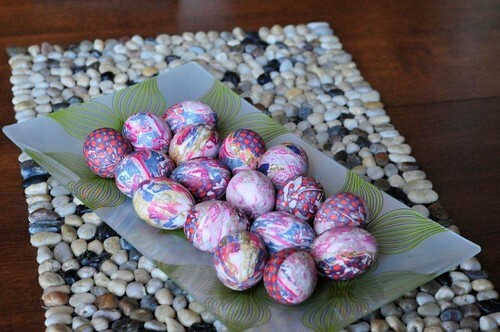 I am so sorry I will miss the tie dye party this year… my personal caveat – use a glass or porcelain pot to boil the eggs! Sandy – why do you suggest that? I have neither glass nor porcelain pots, and was going to do this tonight! I am not quite sure… but I know that they do not turn out as nice if you use an aluminium or metal pot… probably something to do with reactive properties of the metal, silk, and vinegar.. they will work, just not as bright! Salvation Army has a ton! Dang, I was just there for the ties! Oh well — I’ll still try it. Good to know though — thanks! You know what? Ignore that question. I just thought about it for a minute and realized the only reason I’d want to do this is for decoration, and so what the dye or vinegar or anything else does to the eggs is irrelevant. I want them sitting on the table looking pretty! You use vinegar for even the PAAS dye. Doesn’t hurt the eggs a bit. I have a question – if you don’t eat them, and hard boil them thoroughly, do they eventually go bad and stink up the place? 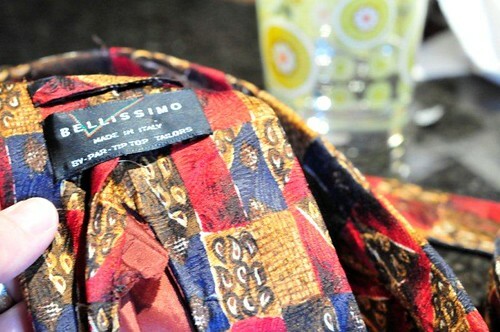 @Ali – my family always refrigerated them, but the hubs’ family always left them on the table in a pretty basket. And then tossed them afterward, but I never smelled anything bad. I think if they aren’t cracked, they’d last … for at least the season. So Erica, they ate them? P.S. did you see in the comments below someone blew hers out and baked the shells to harden them? I wonder if I have the patience, but it sounds rather brilliant. Yup. They ate them! And blowing the eggs out is the way you start pysanky. It’s not as hard as it sounds – I did it for a craft for Liv’s class when she was in KG. I don’t think you’d have to bake them. I never did! I once left some decorated eggs out for ages, and they did start to smell after a time, but they’d been there a while. I’ve also blown eggs but had never heard of baking them before. Seems like it would be a good way make them harder, but do you do that before dying them or after? Eat-the-eggs gets my vote, except in Czukie’s house, where pysanky is something special. Btw, do you ever get brown eggs in the US? We get both brown and white varieties in the UK, but I’ve only seen white ones over the pond. Ok, I’m trying this even if my son doesn’t want to help–too cool not to. Just wait until he goes to work tomorrow! we did these a couple years ago and they were BEAUTIFUL! Melly – who cares how old your daughter is – have fun! Easter only comes once a year!!! If you want to keep them for a long time and don’t want rotten eggs laying around, put a pin hole in the ends and blow the runny egg out first and have scrambles eggs, then “tie-dye” the eggs. We made these eggs twice yesterday!! First my daughter and I made a dozen and they turned out beautiful. Then we went to a egg painting party and brought the silk tie supplies. Everyone was so impressed at how easy and beautiful the eggs turned out!! We used both an enamel pot and stainless steel pot, neither made a difference. Thank you so much, Happy Easter! Creating fun moments with your children such are these are a great way to build their trust and rapport towards you. It is a great way to bond and give them all your time and effort for them to feel that they are loved and they are important. It is best if both parents could do this fun activities together because a complete family would always have an impact to a child. Nonetheless, if you are a single parent, it should not hinder you to become a better parent for your child. 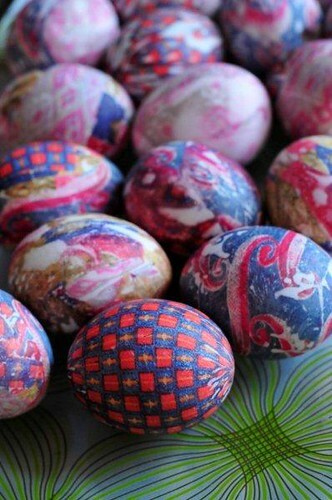 WOW…I know many ways of colouring eggs but this blew my mind away…so cool!!! Now I just need to explain to my husband that some of his old ties can really be “thrown” away…and try this. Alas, it appears that you CANNOT eat these eggs. In this very well researched post (link to follow), Jacqueline Wilson talks to a dye expert and an FDA Representative about the dyes used to dye silk. Both sources indicate that some of the ingredients in those dyes are toxic. Too bad, because this was really neat to look at–but I come from a background where not eating the eggs would be considered a terrible waste of eggs. Any ideas how to get around this? We’ve dyed ours with silk ties for many years, and always eat them. Kudos to Ms. Wilson (WritRams) for actually calling people, but she did not get any authoritative answers. The dye guy just said he didn’t know, and the FDA guy just said it wasn’t approved (huge surprise). That’s just bureaucratic baloney. Enjoy your eggs. These are lovely, but I have to wonder if they are safe to eat. If you buy the ties second hand, who knows what kind of chemicals (dry cleaning) they might contain. I would worry they would leach into the eggs. Oh, they are so beautiful! would they work with silk scarfs? precious know-how on the topic of unpredicted emotions. Can you tell me the purpose of the cotton outer wrap? You can save hard boiled eggs for years in a dry place, uncovered. I discovered this by accident when one Easter some were not found until the next year. Eggs have to be free of cracks. I have had one especially pretty one for over 10 years. Do be careful about eating them, some of the Azo dyes can be quite poisonous, and I don’t know if any of the toxins may permeate the shell. 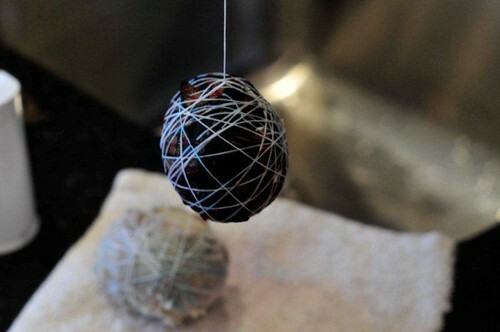 I tried this and my eggs came out really light in color and I used the darkest ties I could find. Does it matter what kind of pot I’m using to boil them in? I have non stick do I need to use something else? What a great idea! I love it and plan to share it with my grandchildren. I’m a foodie, a writer, and a photographer. I love to ski, hike and backpack. The tops of mountains are my favourite place to be. I am a Social Media junkie and strategist. I’m a ProBlogger and PR friendly.